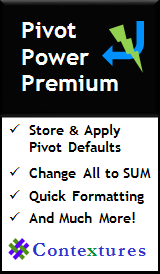 Macros and tips for printing pivot tables. For example, print a separate pivot table or pivot chart for each Report Filter item. If you plan to print a pivot table, its usually better to create a vertical layout, instead of having the pivot table spread horizontally across the worksheet. 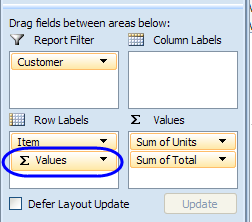 When value fields are added to the pivot table, by default they are arranged horizontally, and that can make the pivot table very wide, especially if column fields are added too. Instead of using the horizontal layout, you can change the value fields to a vertical layout. 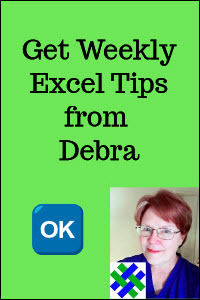 In the Pivot Table Field List, drag the Values button from the Column Labels area to the Row Labels area. 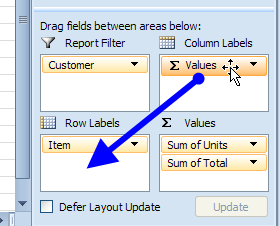 If there aree other fields in the Row Labels area, it is usually best to place the Values fields below those fields. The following code loops through a list of product names on the Lists worksheet. The list is in a range named "ProdPrint". If the product name is found, the Report Filter is changed, and the pivot table is printed. Debug.Print str & " was NOT printed"
The following code will print the pivot table once for each item in the first Report Filter field. Use the PrintPreview line for testing. When ready to print, remove the apostrophe from the beginning of the ActiveSheet.PrintOut line, and add an apostrophe to the beginning of the ActiveSheet.PrintPreview line. The following code will print the active pivot chart once for each item in in the first Report Filter field. Use the PrintPreview line for testing. When ready to print, remove the apostrophe from the beginning of the ActiveSheet.PrintOut line, and add an apostrophe to the beginning of the ActiveSheet.PrintPreview line. The following code will print the pivot table for each combination of Report Filter items. 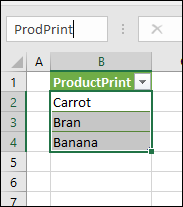 When the macro starts, a message box asks if you want to Print (Yes) or List the combinations (No). This sets the PrintFlag variable to True (Yes) or False (No). If True, the code is currently set to Preview the reports, and you can change the code so it prints instead. & "will be listed on sheet "
strP = "Yes = Print, No = Make List"
strP2 = "Print or List?" MsgBox "The PivotTable has no Pages"
Download the zipped sample file for this pivot table tutorial. The file is in xlsm format and contains macros.